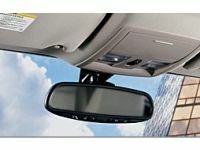 Mopar's Interior Rear View Mirror kit for the Jeep Liberty replaces the existing stock mirror. Compass and Outside temperature display along with auto dimming feature to reduce glare from following motorists. Compass and Temperature Mirror. Complete kit.